A chilly evening at Dolon Omurzhakov stadium in Bishkek saw the final encounter of Group A of 2019 AFC Asian Cup Qualifier between The Kyrgyz Republic and India resulting in a 2-1 win for the home side with goals from Zemlianukhin Anton(2′) and Murzalev Mirlan (72′). The Indian backline was caught napping as they could not hit their strides early into the games under chilling conditions at Bishkek, conceding an early goal in the second minute as Zemlianukhin Anton rattled the net from a cross down the right from Zhyrgalbek Uulu Kairat’s cross. The home side kept the visitors under relentless pressure as Kyrgyz forwards tormented the Indian side-backs Narayan Das and Lalruatthara down both the channels to pile-on the pressure and could have easily enhanced the lead but goalkeeper Gurpreet Singh Sandhu’s heroics under the bar kept the “The White Falcons” at bay. 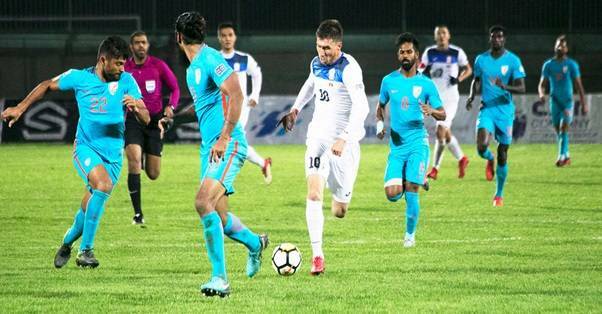 India’s best chance came on 20th-minute when Baimatov Azmhov handled the ball 20 yards out and was awarded a free-kick in a decent striking zone.Rowlin Borges stepped up to the set piece to rattle the post as Balwant Singh hit the net from rebound but was flagged offside. Back in the second half, Kyrgyz maintained the possession and constructed attack from the deep while India looked to play with long ball strategy to find their target man Jeje and Balwant.Kyrgyz managed to put the game beyond contention in the 72nd minute when Murzalev Mirlan’s flick beat Gurpreet inside the 6 yeards box to give the Kyrgyz Republic at 2-0 lead. Jeje managed to pull a goal back for India with a neatly placed header from Narzary’s cross to make it 2-1 in the 88th minute. As the clock ticked by, the central Asian side managed to hold on to their slender lead and picked up all three points at Bishkek with a 2-1 win but India managed to finish top of the group table with a better goal difference as both teams finished with 13 points to qualify for the Asian Cup 2019 finals.